Buy pre-owned machines of any kind (e.g. 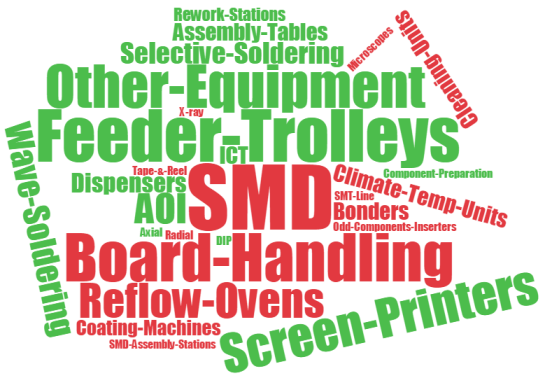 AOI, board handling, feeder trolleys, reflow ovens, SMD or screen printers) from dozens of manufacturers (e.g. Asys, DEK, MPM, Nutek, Philips, Rommel or Siemens/ASM) from AdoptSMT. Search in hundreds of machines we have available on stock or contact us to specify your needs. Well defined, guaranteed AdoptSMT equipment conditions make sure you know what you will get. Buy machines of any kind or manufacturer from AdoptSMT. Search for machines available (add link here) or contact us (add link here). You want to sell your machines from the factory floor or want to buy well-kept equipment directly from the factory floor? Do you want AdoptSMT to re-marked your machines while stil running production at a good price but still be sure the move on time?Or do you want to buy well-kept equipment directly from the factory floor? ... or let AdoptSMT re-market your machines.